This Macbeth is made for the cinema. Vast, incredible vistas, akin to the opening of Werner Herzog’s Aguirre, The Wrath of God are the stage set for this interpretation of Shakespeare’s tragedy. 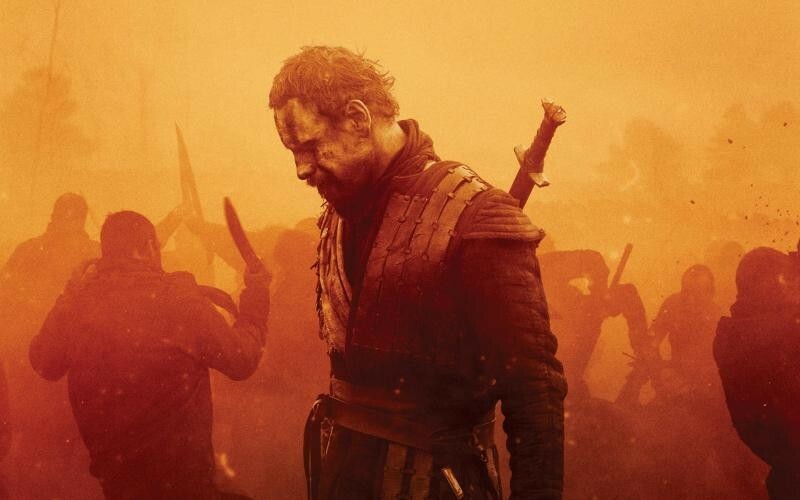 Opening on a funeral for their deceased child, this is the dark cloud that lurks above Macbeth (Michael Fassbender) and his wife. The red-handed Lady (Marion Coitillard) may not be the integral key to unlocking the mysteries of this Macbeth, but she is nevertheless a wreck. Turning from the poisonous snake, whispering her intentions, it is clear that his madness overwhelms her and the power she wielded is lost. Witches lurk in the misty shadows and ghosts stand on expansive fields and control the conflicted King. Shakespeare has never been so gloriously cinematic. An enormous achievement, Fassbender’s hushed, whispered words, turn each screw as he slowly loses his mind. But the breathy wordplay is also a weakness as large chunks of writing is left behind and the breadth of Shakespeare’s variety of language is lost. No “toil and trouble” in this version. Stained faces, going into war, recalls the muddy, wet fight introducing Maximus in Gladiator. Indeed, Justin Kurvel’s take on this Highland Opera is more Kingdom of Heaven, than Game of Thrones. A piercing Scottish score, with bagpipes and booming drums dig deep into your Celtic soul. This is unforgettable filmmaking and, whether you know the play or not (like all of The Bard’s plays, prior knowledge always helps) you won’t take your eyes off the screen.